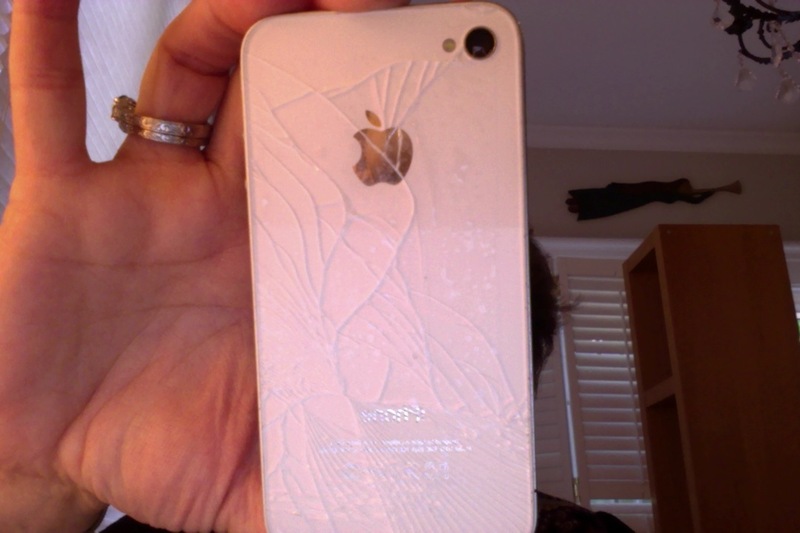 Thanks to a Facebook friend, I was encouraged to visit the Apple Store regarding the smashed back of my iPhone. Sure enough, the repair was $29+tax. If it’d been the front (screen) it would have been another story. I learned the lesson that a phone is not a particularly good thing to use as a bookmark, particularly if you leave it on a counter above a ceramic tile floor. I did a little browsing in the Apple Store while I was waiting (the 10 minutes!) for my phone to be repaired. I came home with a Jawbone Up band, a little bracelet that you wear on your wrist to monitor your physical activity and sleep patterns. The accompanying app also lets you easily track your diet (using barcodes or manual search and a huge database of stored foods.) Even though it was a rainy day yesterday and I spent a lot of it indoors, I managed to log over 7200 steps. (My goal is 10,000 per day). You can set the band to vibrate to remind you to get active every so many minutes, and also to wake you up in the morning. I am very excited about this (as I am about so many things these days). I’m hoping my spouse might consider wearing one as well. Mine is a beautiful turquoise (although they call it mint-green). The band is compatible with iOS and Android. I gave up on Linden MacIntyre’s Why Men Lie. I really enjoyed his previous novel The Bishop’s Man, but I just couldn’t get in to this one. It’s on my Kobo, so I can come back to it later if I want. I picked up VB6: Eat Vegan Before 6:00 to Lose Weight and Restore Your Health . . . for Good by Mark Bittman when I was at Winners of all places. As I believe I’ve mentioned before, I’m heading that way, both in terms of improving my diet as well as shepherding the resources of the planet more effectively. Essentially, he proposes that you eat a vegan diet before 6 pm and then at will after that. Michael and I went to the TSO last night and heard Joshua Bell and Edgar Meyer as featured soloists. Bell is astounding, kind of my Perlman for the new millenium or something. He opened the second half with Ravel’s Tzigane, rapsodie de concert for Violin and Orchestra which begins with an extended solo before the orchestra joins in. I would pay the price of my ticket to hear that piece again. Meyer was featured in his composition, the Canadian premiere of the Concerto for Violin and Double Bass. I was underwhelmed by the composition, but that may just be my lack of comfort with modern repertoire. Or maybe it just needs another listen. The playing by both Bell and Meyer was magnificent. The concert opener (Copland’s Appalachian Spring) and closer (Respighi’s Pini di Roma) were absolute barnbusters, the kind of music that just opens up your heart. Tonight: The Giacomo Variations at the Elgin Theatre, featuring John Malkovich as Casanova. My date is arriving at 5pm, flying in from a week in Vancouver, so I hope his flight is on time. We’ll probably grab dinner at The Paramount. And now my Up band is vibrating to tell me that I’ve been idle for too long! Gotta run. Consider subscribing to my blog by email (or follow me in WordPress) – use the box on the right if you’re reading this in a browser. For more Seven Quick Takes Friday, visit Jennifer at Conversion Diary. Sometimes I think the books I don’t finish say more about me than the ones I do! Can you send me a link, pls?